Previously users would need to load an external application to edit reports, but with this November’s release, the MEX Report Designer has now been integrated into MEX 15. This means you can design reports from within the MEX application directly in your browser. We’ve done this to align how report designing worked back in MEX 12, but at the same time giving it a modern spin. New features include a brand-new look and feel to the MEX Report Designer. With modern tool icons equipping you with all you need to work with report designs in MEX. 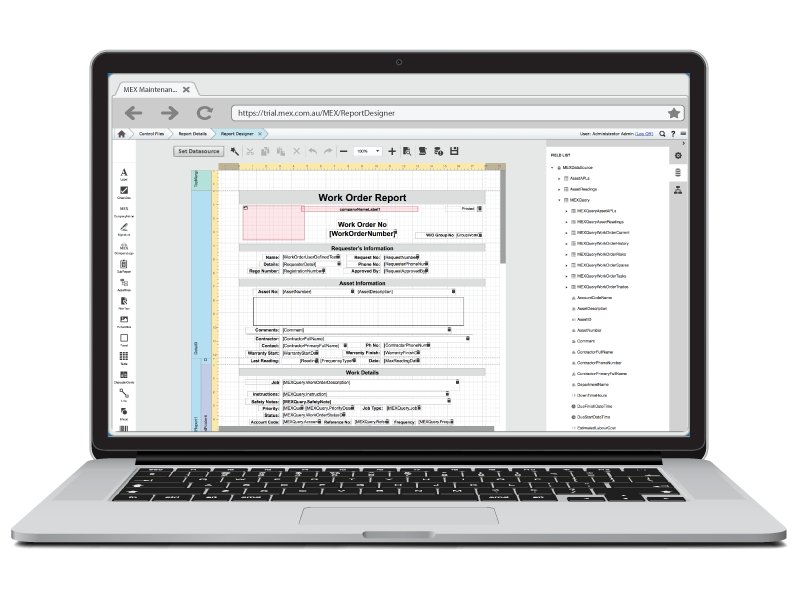 The Report Query Designer has also been upgraded. Now integrated into MEX, you can write up a full SQL query up, search through the MEX Database tables and views and simply drag and drop tables/views to create a new query. As you create your report query, you can preview at any time. Giving you a full look at all the data it is returning, so that you can better visualise your report design. Need to restore a System Report? Access all MEX Reports through the MEX Report Library. A cloud-based repository of all current and new reports.